The gifts given to Christ by the Magi are symbols for his life, being gold for royalty, frankincense for holiness and myrrh for suffering. Even today the first two still are symbols for power and religion, but myrrh is much less well known now yet is used to a very limited in medicines. But what is myrrh? There are a few myrrh-type oleo-gum-resins produced in Arabia and Somalia from the Commiphora genus, all of which were probably lumped together as myrrh in ancient times and still are used to adulterate modern day myrrh. C. myrrha is the chief source of myrrh today, while C. erythraea was probably the “ntyw” (myrrh) of the ancient Egyptians and the “scented myrrh” of Pliny. Commiphora species are native trees of northeast tropical Africa in the region from Somalia to Egypt. 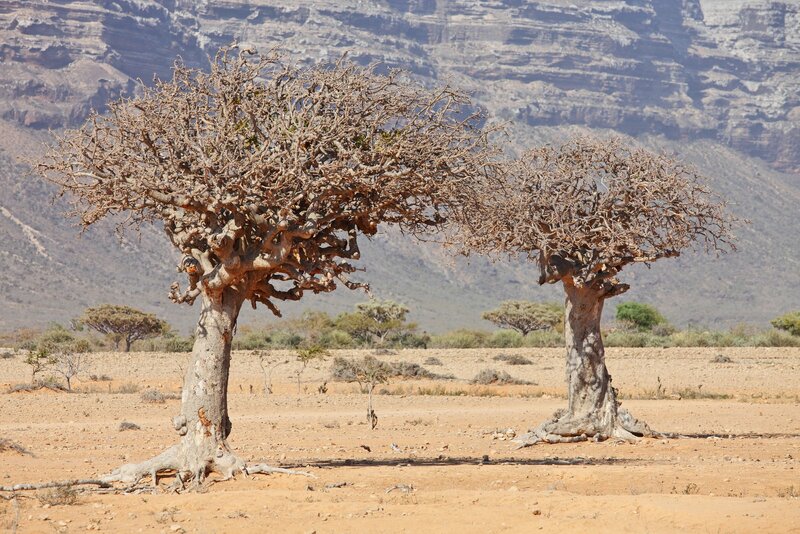 The myrrh trees form dwarfish thickets often with Acacia and Euphorbia. 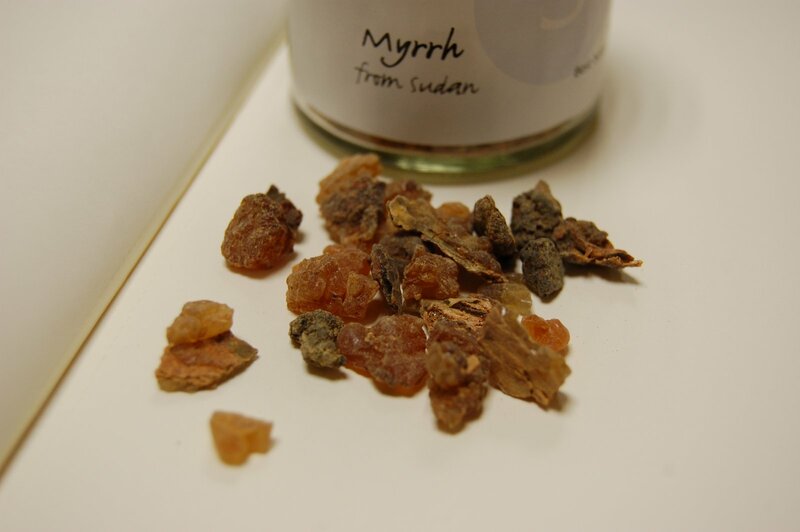 And from a trade perspective, myrrh is mainly shipped through Aden, Djibouti, Massau and Port Sudan. Common myrrh (C. myrrha) is a large shrub that grows to about 9ft. Its branches are knotted with branchlets that are pointed and perpendicular to the main branches. The trifoliate leaves are small and scanty, and are shed in the dry season. 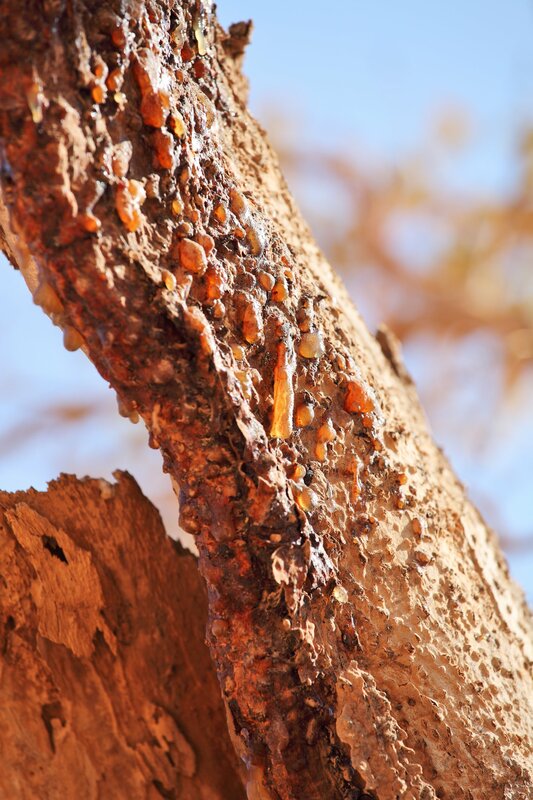 It has whitish-gray bark that is filled with the myrrh oleo-gum-resin reservoirs, which is then collected by incisions of around 10cm (5 inches) being cut into the bark in much the same way as frankincense and rubber are tapped from other trees. As the resin comes into contact with the air, it hardens into “tears”. Myrrh is a natural resin comprising: 3-8% essential oil, 30-60% water-soluble gum and 25-40% alcohol-soluble resins. Myrrh has a reddish-brown colour, is hard to touch and has little aroma, but a mildy woody balsamic base note. Myrrh burns readily with little smoke and gives off a white and pleasantly pungent aroma that is not as heady as frankincense. Myrrh has been used for incense and embalming since ancient times, with ancient Egypt importing large quantities as far back as 2500BCE. Based on Pliny, myrrh comes from the western and west-central areas of South Arabia and in coastal Somaliland. Per Pliny, the total production of myrrh in ancient times was approximately 450-600 tons per annum. Pliny also states that the trees were incised twice every year to tap the myrrh resin, as well as mentioning that there were several kinds of myrrh with a wide range of prices from 3 – 50 denars a pound. Much has been written about the trade routes for both frankincense and myrrh, however the detail is pretty much that these resins tapped into the general trading routes for general goods such as fish & pottery, and more exotic goods such as pearls (Oman), silks (China) and spices (India). So after a land route to the major ports of Arabia, they went by sea to other major ports throughout Africa, Arabia and India then into the Mediterranean and by land to those places that could not be reached initially by sea. These routes were intertwined and complex, so for example in ancient times, along these trade routes, cinnamon could move from Sri Lanka to Egypt to appease the gods after the death of Rameses III, and later throughout Arabia and the Mediterranean per Pliny with Petra at the centre of a global supply chain that stored and then distributed incense, silks and spices to feed demand from the Greek and Roman elite for luxury goods. The aroma of myrrh is exotic, warm-balsamic and sweet and when fresh spicy-aromatic, sharp and pungent. As such, myrrh is used by perfumiers as a flavour in Oriental-spicy perfumes and for woody bases, forest notes and pine fragrances. Myrrh blends really well with geranium, musk, patchouli and woody spices and some strong floral bases such as rose. For example, myrrh is used in branded perfumes like Fidji by Guy Laroche, KL by Karl Lagerfeld, Le Jardin by Max Factor and Gianni Versace by Charles of the Ritz. In ancient times, myrrh was used as a base for perfumes that were used by royalty, so for example it was used as a fragrance (Song of Solomon 1:13, 5:5; Esther 2:12) and in Egypt by Hatshepsut, as well as gifts to Amenhotep and Akhnaton. While myrrh defeated the inventive Heston Blumenthal in his "Perfect Christmas" programme, it is used in some products as a flavouring, for example toothpastes, mouthwashes, gargles and mouthsprays. In these, myrrh is characterised by an acrid-aromatic taste that works well against clove, eucalyptus, mint, thyme and other cleansing and medicinal flavours. It is interesting that some herbalists use tincture of myrrh as an astringent for the mucous membranes of the mouth and throat, which is similar to how it used in oral hygiene. From a culinary perspective, Pliny points to the spicing of wine with myrrh among the Romans (catissima apud priscos vina erarit murrae odore condita; Pliny, Nat. Hist. 14.92), acting as a preservative and imparting a slightly bitter taste. Also, wine is still mixed with resins (retsina in Greece), spices (mulled wine across Europe), and some wine can taste like burnt tyres (Chateau Musar White to my palate) but is still drunk; in life now, we all have different tastes and in the developed world we probably eat and drink less bitter foods and drink than in other parts of the world and perhaps should for our health, veering to sweet and salty foods. In fact, Roman wine would have been highly aromatic as wine amphorae were lined with a resin from pine trees, so imparting a distinctive flavour to some of the long-hauled wine in the Roman Empire, which is basis for retsina idea today. However, it was also mixed with wine for medicinal reasons. Myrrh’s medicinal use in ancient times included 54 references to its use in Hippocratic literature. Per Wikipedia, myrrh is used for blood ailments because of its purported blood-moving properties (Chinese medicine) and as a tonic in Ayurvedic medicine [interestingly Ayurvedic medicine has it as contraindicated for uterine problems, which are specifically promoted as a positive area by Chinese medicine]. The mixing with wine may simply be a red herring, with wine being the simplest method for dissolving the myrrh before using it as a medicine and takes about 10 minutes to dissolve in wine, within which time it has not dissolved in water. So one finds it is used to cure wounds (Herodotus 7.181), as a soporific (Pliny, Nat. Hist. 34.140), or mixed with other substances as an analgesic (Columella 6.38; Pliny 28.179 and 29.137), but these qualities are not particularly strong. But when mixed with wine it makes the wine unpalatable tasting like vinegar, so perhaps it could have been a cruel joke for someone gasping for a drink. Finally, it was also used in embalming in Egypt and the region, being quoted by Herodotus as an ingredient for the most expensive embalming techniques.